The world is on the verge of hitting global “tipping points” that could make global warming irreversible, warned scientists at a London conference this week. Their message was firm but clear: if we don’t act quickly this decade, we may irreversibly be sending the Earth hurtling towards 6 degrees of warming in 100 years. The “global tipping points” they are referring to include the melting polar ice caps, the loss of rainforests, and the release of methane in the Arctic. Once a tipping point is reached, no action we take can reverse global warming. 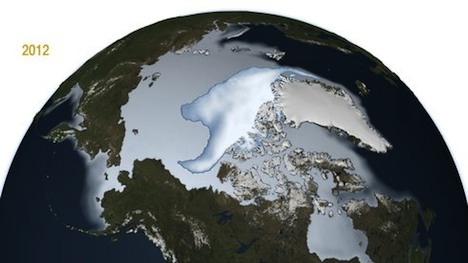 Take the melting of sea ice in the Arctic, for instance. Recently, a group of Arctic researchers have raised alarm about the devastating effect large-scale sea ice melt could have, as it would release massive amounts of methane – a much more potent greenhouse gas than CO2. Although the exact implications of large-scale sea ice melt is still unclear, they claim it could begin to happen within the next decade. As the Earth warms, the Amazon rainforest will become drier, leading to drought and eventual mass tree deaths. And while the Amazon rainforest extracts more carbon than it emits now (a carbon sink), warming could reverse the process and turn it into a carbon source instead. Finally, scientists are still unaware of the effect melting permafrost in Siberia will have. Currently large amounts of carbon are stored under the frozen Siberian surface. If global warming melts the permafrost, it could release large amounts of carbon into the air. Is there much to be optimistic about? Although the recent climate talks in Durban resulted in a legally binding plan to curb carbon emissions, the CO2 cuts won’t happen until 2020, which could be too late to reverse climate change. Meanwhile, climate modeller Peter Cox claims we could buy ourselves a bit of time if we focus current efforts on reducing methane emissions. But even he acknowledges that this would give us only a 15 year window to really tackle greenhouse gas emissions. If there was ever a time to urgently slash rising greenhouse emissions, this is it. Yet the legally-binding global framework for tackling global warming may have come a decade too late, leaving us only with a hope that countries will take it upon themselves to embrace the necessary environmental policies (Germany is already leading the way in this regard). As a recent (and provocative) piece by Brian Merchant seems to suggest, perhaps there is not much left to be done – there are no real solutions left to offer. What are your thoughts? Are you hopeful that we can do something to tackle climate change within the next decade? Next post: Earth Hour 2012 Done: So What Now?